A documentary film shot in 16mm film and DVCAM. Running time 19 minutes. Arms locked and heads bowed, the rugby players move as one – a single panting, mud-caked, sweat-soaked beast straining to push back the opposing side and gain possession of the ball. So begins Into the Scrum, a dynamic and innovative short documentary that, following a team of female rugby players for a year, offers an intimate portrait of an unforgettable collection of young women as they explore newfound, often provocative, roles and rituals of power, aggression, and sexual identity – as they test themselves, both on and off the field, by moving into the “scrum”. Shot in first-person perspective on 16mm film and DVCAM, deploying a body-cam and making use of radiant hand-painted animation, the film renders rugby’s fierce physical poetry as it reveals the physical, emotional, and psychological contours of these remarkably thoughtful and adventurous young women’s personal and shared paths to adulthood. In order to make this film I joined the "Rhinos", The Oberlin College Women's Rugby team for one year. 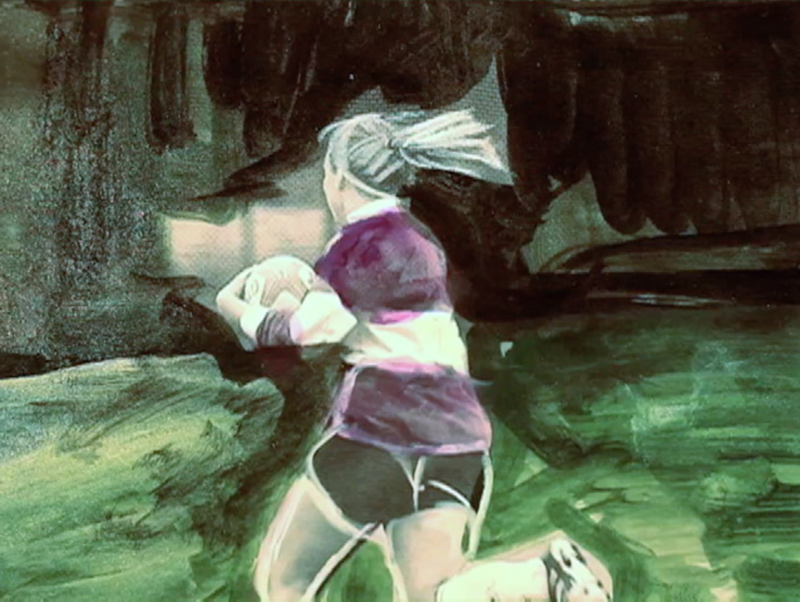 Most of the players happened to be my art students, many of whom were in my film class during the day, and in the afternoon, the roles switched as I became their student as they taught me how to tackle, ruck, maul and brought me into the inner circle of women's rugby. There were many unexpected twists and turns throughout this experience, and it proved to be much more than learning how to be tackled. As I grew closer to the team, and mutual trust was built, I interviewed the team members in my studio individually, and filmed as a collective scrum them on the field. I played in each game, and often passed the camera off to the other players. My two young sons often accompanied me to practices. It was an unforgettable experience. 2014 Massachusetts College of Art, Film Society.